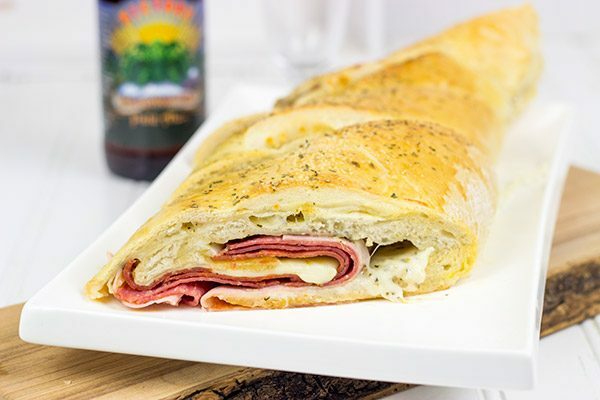 This Classic Stromboli is what happens when a pizza meets an Italian sub! Dear, pizza. How do I love thee? Let me count the ways. Here in upstate New York, we have at least one pizza shop on every corner. Sometimes two. Back at the end of last year, one of my curling buddies ordered some pizzas to be delivered to the club after our game. Awesome! And even more awesome was the fact that a stromboli was included in there. 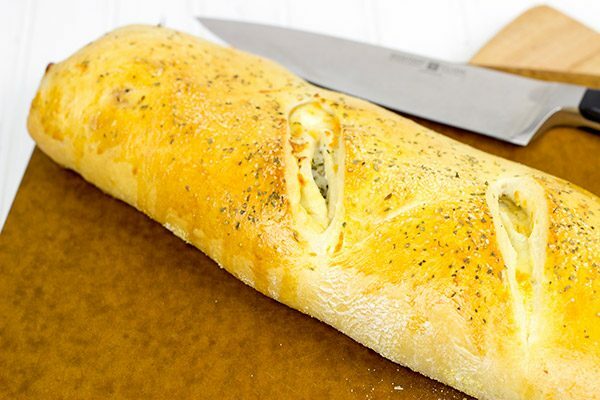 A stromboli is what happens when an Italian sandwich meets a pizza. 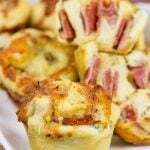 You’ve got classic Italian meats like pepperoni and salami in there. But then you’ve also got mozzarella and provolone cheese, and then the whole thing is folded into a pizza-like dough. It’s nothing short of delicious! I brought my wife a leftover slice of stromboli home from the curling club that night, and we shared it for lunch the next day. It didn’t take long before we had ordered another one for ourselves. So I decided to hit the kitchen and create my own stromboli. Nothing beats homemade, right? For this first version of a stromboli (more will be coming for sure! 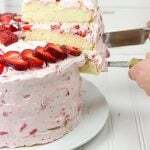 ), I stuck to the classic fillings. Pepperoni, salami, ham. Mozzaralla, provolone, Parmesan. Fold all that deliciousness up and bake it for ~20 minutes, and you’ve got yourself one heck of an awesome meal! But there’s one strange thing about strombolis. I can’t seem to figure out if they should have sauce in them or not. The couple that we’ve had around here didn’t have sauce, although one was served with a side of sauce for dipping. (The others didn’t come with sauce for dipping.) I looked at no less than 25 stromboli recipes online, too…and there was a mix when it came to sauce. The classic toppings were more or less the same, but the sauce varied. So I decided to put the sauce in this recipe as optional. 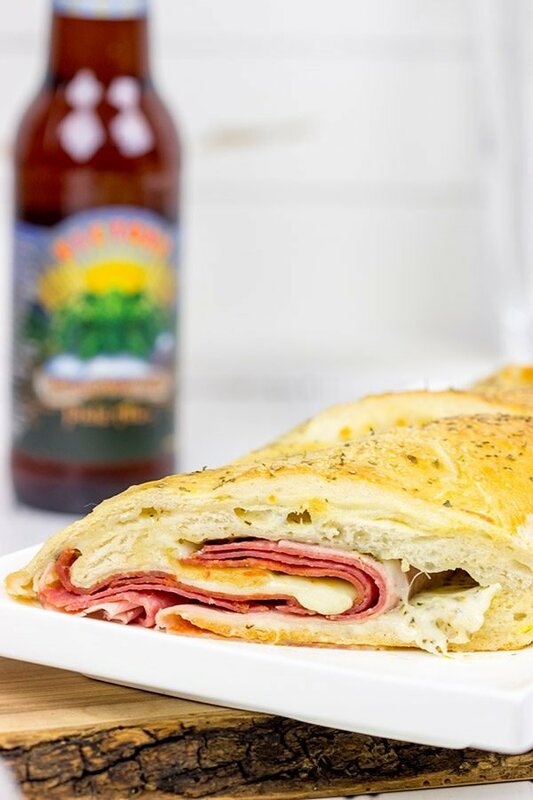 We didn’t put the sauce in this classic stromboli, but we did serve it on the side for dipping. Good call in my opinion. But maybe next time I’ll experiment with including the sauce in the stromboli itself. Either way, I can promise that this stromboli will be delicious! Enjoy! 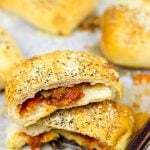 Should a stromboli include sauce inside? Or as a dipping sauce on side? Or neither? What is the most unique topping you’ve eaten on a pizza? Using a large mixing bowl, combine ½ cup of flour with the yeast, sugar and water. Stir until well combined; let mixture rest for 15 minutes. Add the remaining flour, olive oil and salt; mix on low speed until well combined. Increase speed to medium and mix for 3-4 minutes. Transfer dough into a lightly oiled bowl, cover and let rest at room temperature for 1 hour. Turn dough out onto lightly floured countertop and fold several times. Place back into bowl, cover and let rest at room temperature for ~30 minutes, or until dough has doubled in size. 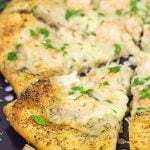 With a long side of the dough facing you, spread the pizza sauce (if using) evenly across dough, leaving 1” border on both of the longer sides. Next, spread the mozzarella evenly across dough. Sprinkle 1 tsp of Italian seasonings on top of cheese. Brush the long edge of the dough closest to you with the beaten egg. Starting with the opposite long end (the one without the egg wash) roll the dough towards you into a tight cylinder. Pinch edges of dough to seal. Brush top of dough with remaining egg wash and sprinkle with remaining ¼ tsp of Italian seasonings and kosher salt. Preheat oven to 400°F. 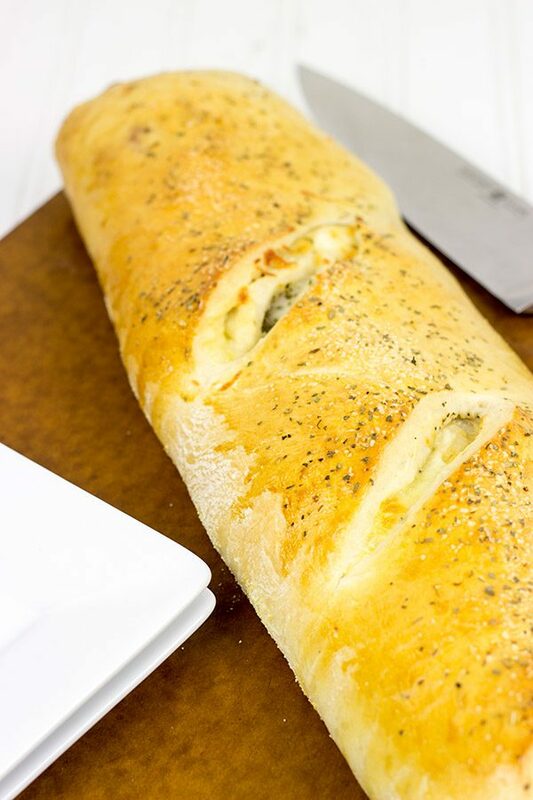 While oven heats, let Stromboli rest at room temperature for ~15 minutes. Let cool for 5 minutes before slicing. Stromboli! Sounds like a fun twist and a perfect pair with cold beer. And yes, nothing beats homemade! 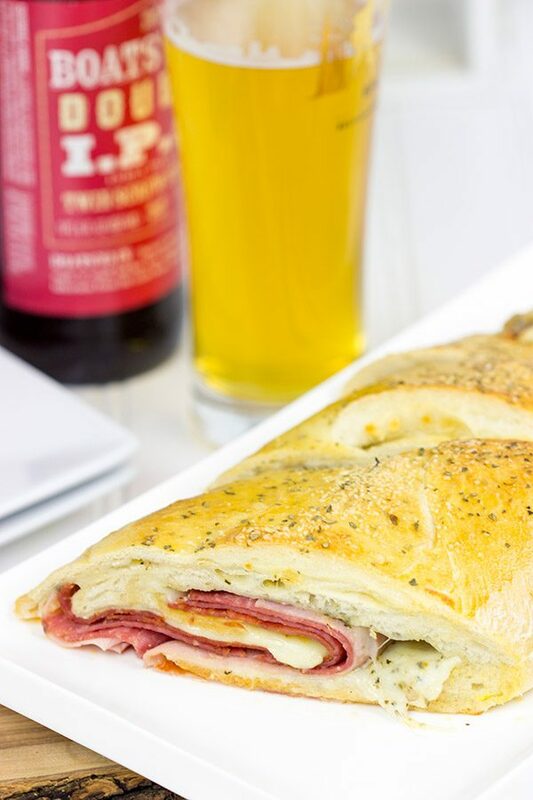 I love Stromboli David and Yes cold beer and Stromboli – ahh I wish it was already dinner time!! I love Stromboli and haven’t made one in forever! 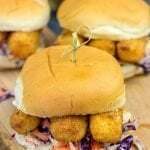 Yours is totally inspiring me to either order one or make one because this looks delicious! I’m in the sauce on the side camp and the same goes for calzones. 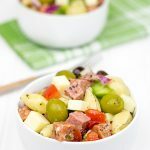 As far as the most unique topping I’ve had on a pizza… mine would have to be potatoes – while they seem to be the norm in the Spiced kitchen – they are pretty darn exotic -on pizza- to me! Happy Monday my Upstate-NYC friend! Homemade totally wins. Always! Of course, it is nice to have someone else make it…but homemade still always wins. 🙂 Potatoes are totally a strange thing on pizzas. We discovered a little pizza shop around the corner from us that put roasted potatoes on pizza, and I was intrigued. They’re tasty for sure. But I still go back to the classic toppings when I want a good comfort food pizza…or calzone…or stromboli. As always, Dave, good looking food! If it were me, I’d say sauce on the side. I think it’s tastier. Though, i can’t claim to be an expert on Italian food. When it comes to cousins, though, I am an expert. I come from a long line of six-kid families. If you measure two people back to their common ancestor and it turns out that there are an uneven number of family tree nodes between you, you use the term “removed” to account for the nodes. Thus, your cousin’s children are your first cousins once removed. They are your children’s 2nd cousins. Woah, my mind is blown, Jeff. You should have been a genealogist. A genealogist who makes incredibly good lookin’ chicken salad sammiches. Seriously…I’d expect that to be on your resume. If you were actually a genealogist, of course. My wife comes from a huge Italian family, so there are always distant relatives around, but I never know the exact relation for the life of me. My family on the other hand is quite easy. It’s me and my sister. Even I can manage to keep that one straight! I think sauce should be on the side! but sauce or not your stromboli is still delicious! Actually I hardly understand the difference between pizza and stromboli..haha..
1. I brought my wife a leftover slice of stromboli home from the curling club that night, and we shared it for lunch the next day. – So much for bringing it ‘for Laura’. 3. I need this. Seriously, the fact that you used more than one cheese and more than one meat…Gah. Okay, officially salivating. I’d try and hunt one down here but no one eats in LA. (They asked me if I wanted my bagel scooped). Yum, stromboli. My sister makes some of the best stromboli. But I am sure your stromboli would be just as delicious. I just love all the yummy meat with the melted cheese wrapped up in all that yummy crusty bread. Holy Yummers! I love pizza and I love bread! So I think I’m in love with a Stromboli! I have never had one before, but whoever decided to mix a pizza with a sandwich is clearly some kind of genius that I need to be best friends with, so they can make me this every day! 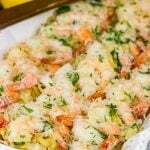 Looks delicious, never thought of making it at home, but seems I’ve been missing out! I always wanted to try stromboli at home. Thank you for sharing. They look so delicious 🙂 Can’t wait to try this out! Wow, you’ve made pizzas in many ways, David! I just didn’t find a pizza pasta bake. Too bad. You should fix it. Could you imagine gooey cheesy baked pasta topped with all your favorite toppings (Don’t put lavender on it, though)? And I know this is a shame, but I’ve never made stromboli…I might have never tried them either. Now this is sad. Send me some please to fix this ASAP. This Stromboli might just win me Mother of the Year. I can’t wait to try this out for a nice little twist on pizza night!